Skip Schumaker, Relief Ace | How Do I Baseball? Last night’s turd of a game between the Los Angeles Dodgers and the Colorado Rockies was chock full of head turning (and scratching) lines in the boxscore. – Rookie Rockie Nolan Arenado‘s first major league home run? Bully! – Rockie starter Tyler Chatwood‘s 3-4, 2 RBI night with the bat to go along with his 6 IP, 0 ER, 5 K pitching effort? Huzzah! – Ted Lilly‘s 3 IP, 2 homeru-let me stop right there with that. – Josh Wall‘s 2 IP, 7 earned r-NO NO NO STOP. 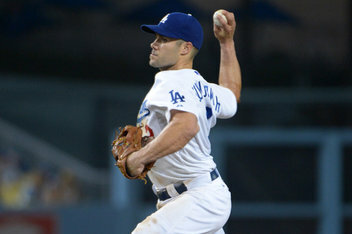 … Dodger shortstop Skip Schumaker‘s relief outing? For the boys in blue, that’s about as good as it got last night – a position player coming in to adequately pitch and stop the bleeding. For Schumaker, last night’s one inning of 2 hit, 1 walk, no run ball marked the second time he came in to hold down the fort pitching-wise, having previously pitched a 1 inning, 2 run outing in 2011 for the St. Louis Cardinals. First off, let me just say what an impressive array of pitches Skip has; while I have my doubts as to whether he has a ‘true’ cutter, the fact that he mixed in a knuckleball to go along with a fastball in the high 80s/low 90s (which is about MLB average might I add) is pretty gutsy. Looking at the pitch Linear Weights, Schumaker’s pitches are all pretty decent, save for the cutter (more than likely just a two-seam fastball). By the looks of it, Skip should ditch the cutter and focus more on throwing four-seam fastballs, changeups and curve balls; he seemed to have a hard time throwing the cutter for strikes or even remotely close to the plate. Whittling down the repertoire to a solid 2 -to- 2.5 pitches with command should suit him nicely. While Schumaker has a way to go to wrest the crown of ‘best pitcher to come out of UC-Santa Barbara‘ off of Barry Zito‘s head, his inning last night showed not only Schumaker’s positional flexibility and willingness to contribute to his team’s success in any way, he showed off a pitching prowess that is sorely lacking in the Dodgers pitching staff, hit hard with injuries to Zack Greinke, Chris Capuano, Ted Lilly, and Chad Billingsley. Matt Guerrier, you’re on notice.